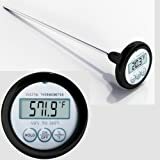 #1 Best Digital Meat Thermometer ★RiskFree Lifetime Money Back Guarantee ★ 8 (20 cm) Extra Long Stainless Steel Probe -58°F to 572°F Wide Temperature Digital Kitchen Thermometer ★Easy Safe Barbecue Grill Thermometer and BBQ Thermometer ★Instant Read (UPC 713228307522) is sold at the following online stores. We've find the latest prices so you can compare prices and save money when making your purchases online. Please click on the links below to browse to each store's webpage.